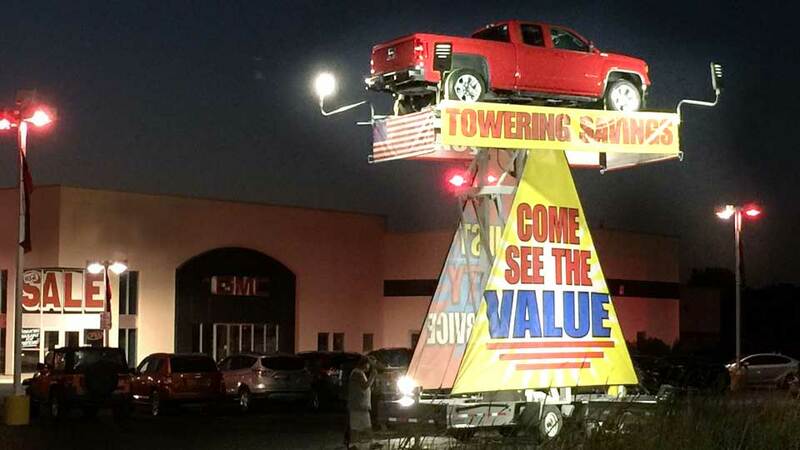 The Tallest Manufactured Rotating Auto Displays In The World! The “AutoSpin” is designed to provide dealerships with a professional grade, attention-grabbing mechanism to attract new qualified buyers to their showrooms. There is no better way to drive UPS … than to go UP! 25 Feet in the air!!! 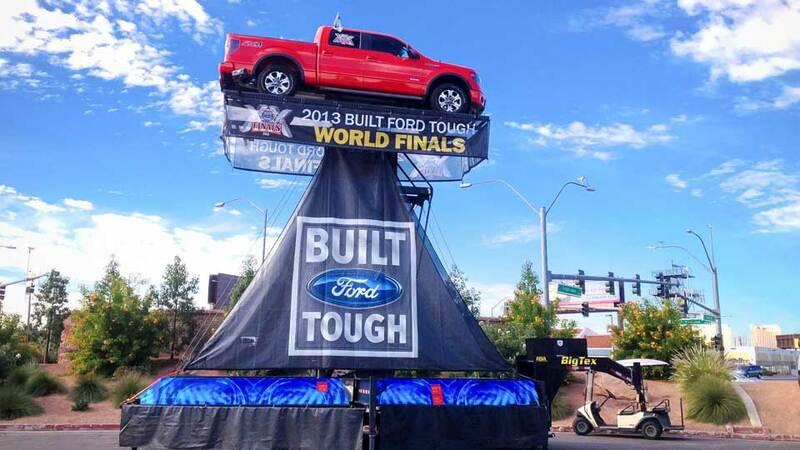 Raises a vehicle 25 feet in the air. Rotates 2 ¼ revolutions per minute. Holds any car, truck or SUV weighing up to 10,000 lbs. Completely portable, moves from one location to another easily. Set-up takes less than 30 minutes. AutoSpinUSA.com lights up the skyline 24/7. Own the roadside and see your frontline from over 1 mile away! Pull in passersby with your existing inventory! 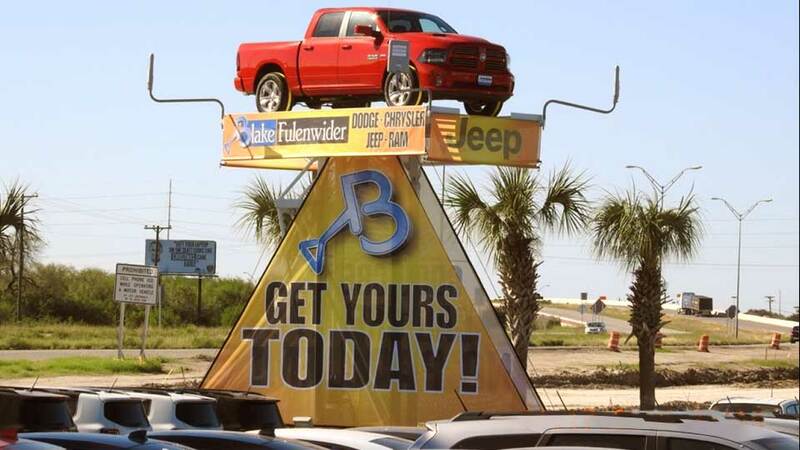 AutoSpin is easily complemented by Customized Interchangeable ‘Banner-Style’ Graphics Packages that appropriately integrate your Dealership’s Name, Logo and Affiliations with your latest Sales and Promotions programs. Built Solid, Safe and Secure. 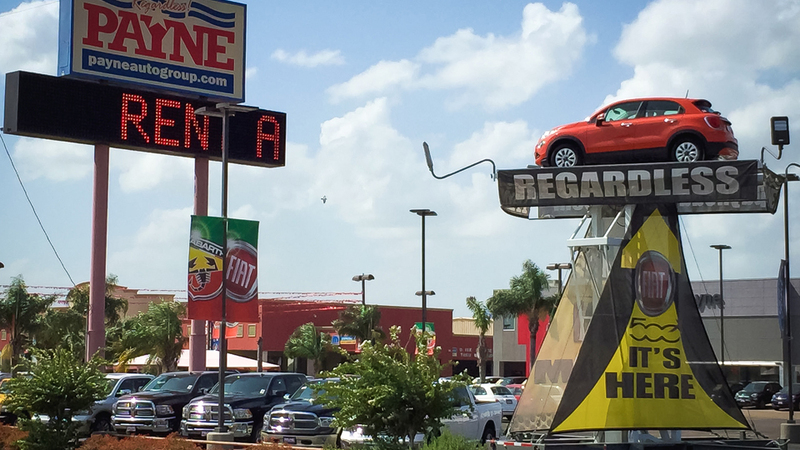 Auto Spin USA knows how to make things big, tall and most importantly safe. 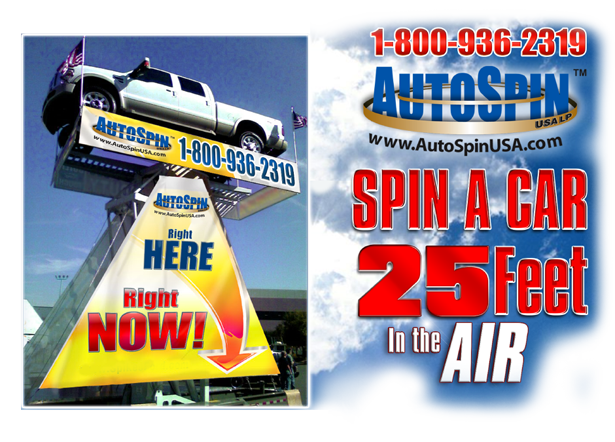 The AutoSpin is the Tallest Manufactured Auto Displays In The World – backed by 2 million in insurance! Any occasion: Holiday, sales promotion. Integrate your name, logo & corporate affiliations. Full color ‘banner style’ graphics. I compete with all the big franchise guys. The Autospin is really a great attraction to bring folks to us. Wouldn't be without it! We got rid of newspapers to get three Autospins, and wow what an R.O.I.